PracticeLink.com S PRIN g 2018 39 At St. Mary's Medical Center, we're equally committed to exceptional patient care and a high standard of living for our teams. A move to western Colorado means trading your daily commute for an evening trail run, and congestion for clean mountain air. As the largest medical center between Salt Lake City and Denver, we offer sophisticated care and technology without big city hassles. Big city medicine without big city hassles. Currently recruiting physicians for: • Cardiothoracic Surgery • Vascular Surgery • Hospitalist • Medical Oncology • Sleep Medicine • Nephrology • Family Medicine Residency Faculty Contact Miranda Ashman, Physician Recruiter for details: miranda.ashman@sclhs.net 9780-298-1990 ©2017 Sisters of Charity of Leavenworth Health System, Inc. All rights reserved. 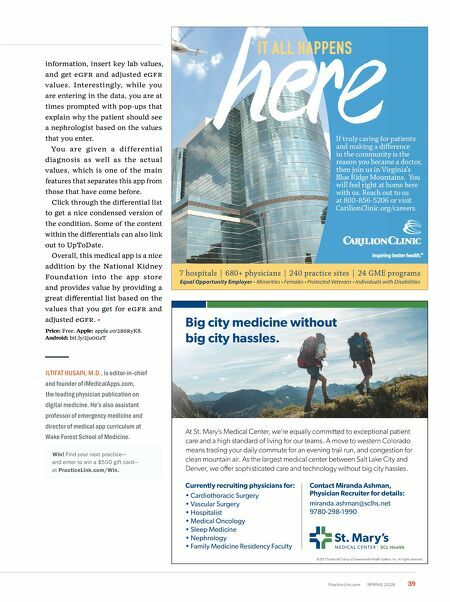 7 hospitals | 680+ physicians | 240 practice sites | 24 GME programs Equal Opportunity Employer - Minorities • Females • Protected Veterans • Individuals with Disabilities IT ALL HAPPENS If truly caring for patients and making a difference in the community is the reason you became a doctor, then join us in Virginia's Blue Ridge Mountains. You will feel right at home here with us. Reach out to us at 800-856-5206 or visit CarilionClinic.org/careers. information, insert key lab values, and get e g FR and adjusted e g FR values. Interestingly, while you are entering in the data, you are at times prompted with pop-ups that explain why the patient should see a nephrologist based on the values that you enter. You are given a differential diagnosis as well as the actual values, which is one of the main features that separates this app from those that have come before. Click through the differential list to get a nice condensed version of the condition. Some of the content within the differentials can also link out to UpToDate. 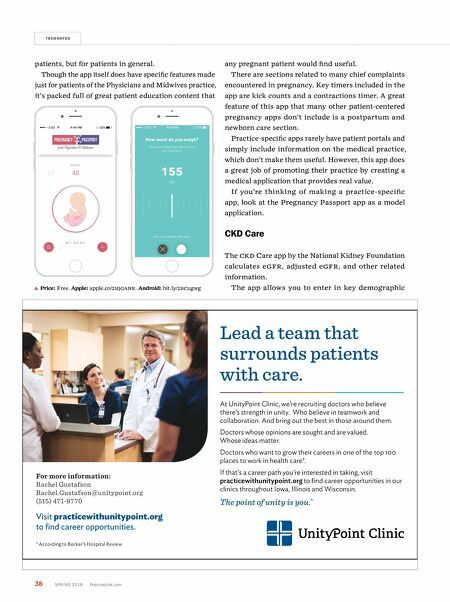 Overall, this medical app is a nice addition by the National Kidney Foundation into the app store and provides value by providing a great differential list based on the values that you get for e g FR and adjusted e g FR. Price: Free. Apple: apple.co/2BSRyK8. Android: bit.ly/2ju og zT ILTIFAT HUSAIN, M.D., is editor-in-chief and founder of iMedicalApps.com, the leading physician publication on digital medicine. He's also assistant professor of emergency medicine and director of medical app curriculum at Wake Forest School of Medicine. Win! Find your next practice— and enter to win a $500 gift card— at PracticeLink.com/Win.